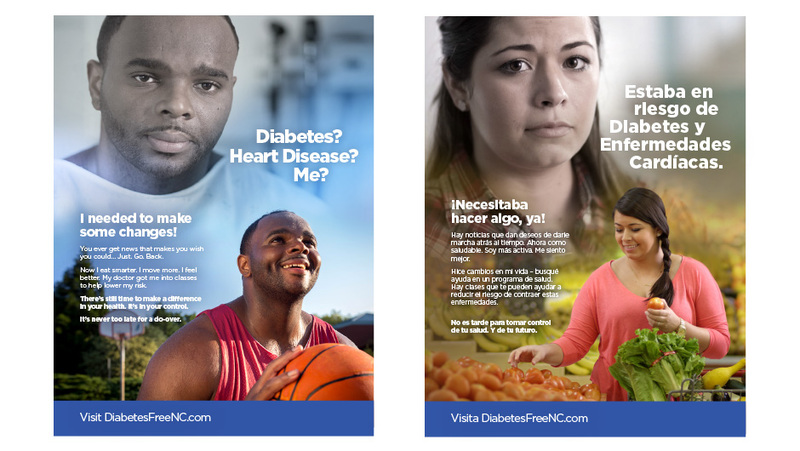 North Carolina Department of Public Health needed to develop a communications campaign to encourage healthy behaviors and increase participation in diabetes and heart disease prevention for CDC-recognized diabetes prevention programs. Increase awareness of risk factors and highlighting behavior changes that can help prevent these diseases. After researching pre-diabetes and diabetes, O’Neill Communications lead NC public health’s team through a creative process to develop the campaign concept, copy writing, storyboarding and the production of a :30 sec and :15 second television spot, radio ads and print and digital ads in both English and Spanish using talent, locations and dialect that are sensitive to the ethnic and culture diversity of the target market. Campaign development included billboards, animated GIFs, a variety of print ads and media buying recommendations. The media campaign is scheduled to launch in January 2016. The client was on location for two days during the television production, selected both radio and television talent and was very satisfied with the creative process and resources that were produced.